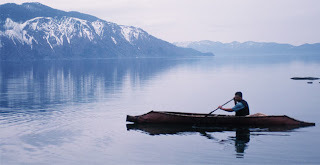 My previous posting, concerning the sturgeon-nose canoes of the (North American) Pacific Northwest, generated a comment by "Anonymous" who mentioned that the Nivkh people of Siberia also built sturgeon-nose bark canoes. I did a quick Google search which didn't reveal any specifics about these, but it did turn up the information that the Nivkh people were a maritime culture of the Siberian northeast with certain cultural similarities to the Ainu of northern Japan. In addition to their use of bark canoes, the Nivkh also built dugouts of poplar. The photo above, from the Russian pages of Wikipedia, shows a Nivkh dugout under oars. Three oarsmen sit in the bow, each pulling two oars, while a helmsman sits high on the rounded stern, steering with a paddle. There is much empty space between them for cargo or passengers. The bow has substantial overhang, and some kind of decorative stem post rising about to the level of the rowers' heads. There is one thwart visible aft of the aft-most rower, and from the first and third rowers' elevated positions, it appears that they are not sitting in the canoe's bottom; i.e., they must be sitting on seat thwarts or some loose objects. The middle rower appears to be somewhat lower and might be sitting in the bottom. I can not make out the object that appears between the head of the first rower and the stem post. It looks like a paddle or oar blade, but its location there makes no sense to me. Sturgeon-nose or ram-ended canoes of were used in the interior of British Columbia and Washington by the Kutenai, Kalispel, Salish, and Sinixt people. 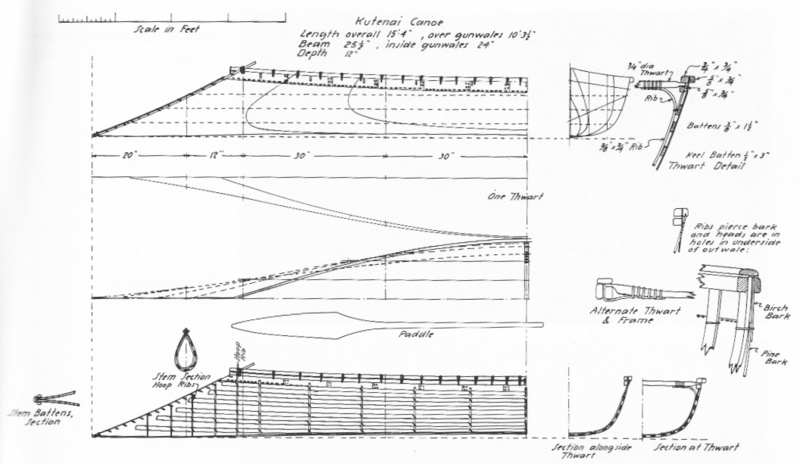 While instantly recognizable by the unusual reverse slope of the bow and stern, they possessed several additional features that distinguish them from other North American bark canoes. 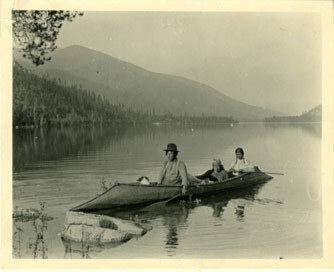 According to Adney (in Bark Canoes and Skin Boats of North America , from which most of the following content derives), sturgeon-nose canoes were built from whatever bark was convenient: birch, spruce, fir, or white pine, the latter apparently being a common choice. (As with birchbark canoes, the rough outer surface was turned inward to face the boat's interior.) Whenever possible, upper panels of birchbark were sewn in for the entire length of the boat, with the grain running fore-and-aft. 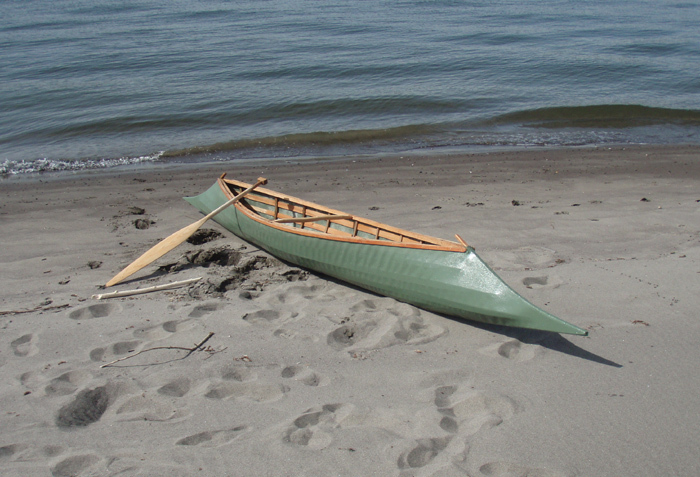 15'4" LOA Kutenai canoe, from Adney & Chapelle. Click for larger view. These canoes had no sheathing in the normal sense. Typically 12 cedar battens, measuring about 3/8" by 1.5" in section, ran fore-and-aft, leaving about half of the bark unsheathed on the inside. (In most North American bark canoes, thin planks sheath the entire interior surface of the bark, with the exception of a few inches toward the very ends.) There was also a light keelson, about 1/2" x 3" in section. The battens and keelson were held in place by the pressure of light (1/4" x 3/4" section) ribs, spaced on very wide (8" - 12") centers. Some of the ribs were tied to some of the battens, but not all intersections were thus lashed. In the ends, the ribs were hoop-shaped, i.e., closed at the top. All woodwork was cedar. There were no stem-pieces per se, but three stem battens reinforced the upward-facing bark end seam, one on each side, and one at the end, forming a "cap." The three battens and the bark were pitched and sewn together. The end battens extended a few inches above the gunwales: this must have been purely aesthetic. Two gunwale arrangements were common. The first was the common three-piece combination of inwale, outwale, and cap, with the rib ends sandwiched between the inwale and the bark. The other arrangement, which I have not seen in other North American bark canoes, involved upper and lower inwales and an outwale, but no cap. 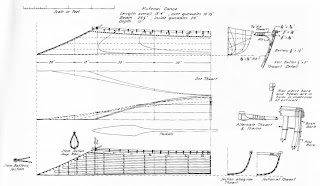 The ribs pierced through holes in the bark envelope where the upper, birchbark panel was sewn to the lower main envelope, so that their uppermost few inches were on the outside of the hull. Their upper ends were sandwiched between the outwale and the bark. Often, only one thwart was used, amidships, but there were not infrequently three. While thwarts keep the gunwales apart and thus spread the boat's opening, sometimes hide straps, spaced between the center and end thwarts, were used to pull the gunwales inward. Bottom sections tended to be very round, but some canoes had a slightly flattened bottom and flaring sides, The enclosed ends were nearly elliptical, except for their pointed upper end. 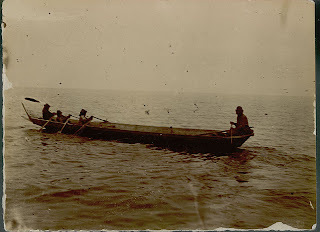 The bottom tended to be hogged, but because of the boat's light structure, the ends came up when it was loaded so that in use, the boat had a slightly rockered bottom. Most were 14' to 20' LOA and quite narrow -- 24" to 28" in beam, although examples as long as 24' and as broad as 48" are known. The overall form is somewhat of a mystery. Although they have the reputation of being particularly well-suited to the particular mix of condition in their users' environment (large open lakes, swamps, swift rivers), it's hard to see what aspects of their form makes it so, or in any way superior to other First People designs. The ram bow might provide benefits when crossing large areas of open water, by extending the waterline and by providing what amounts to a "bulbous bow" similar to that seen on most large modern cargo ships. But the narrow beam is a liability here, and the bow, with its lack of flare and its rapidly-diminishing buoyancy, is far less suitable than that of a conventional flared bow when encountering wind-driven waves. Furthermore, the pointed bow at or below the waterline would be tend to catch vegetation in swamps, and would impair both maneuverability and durability in rocky rapids. 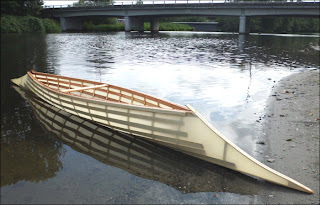 While a rarity today, there have been a few modern replicas and interpretations of the sturgeon-nosed canoe. The white pine-bark example shown above was by built by J.R. Bluff sometime after 1991. 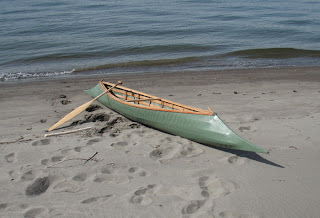 Harvey Golden's canvas-skinned Kutenai canoe. A fine canvas-covered example was built in 2010 by Harvey Golden (above). Paul Montgomery's modern, nylon-skinned interpretation of a Sinixt sturgeon-nosed canoe. Among the nicest is a nylon-on-frame example recently completed by Paul Montgomery (above). Montgomery's project is detailed on his website PaddleAndOar.com, which also contains a valuable list of links on the subject.